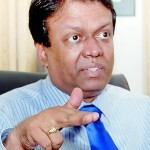 Dr. Pradeep Kariyawasam, the Chief Medical Officer of Health of the Colombo Municipal Council who retired this week has been appointed as the Deputy Municipal Commissioner (Health Services) by the Governor of Western Province . The appointment was made on the recommendation of the Mayor of Colombo A.J.M. Muzamil with the approval of the Chief Minister of Western Province. The DMC (Health Services) will be supervising the work of four health departments in the CMC namely the Public Health Department, The Curative Health Department, The Municipal Veterinary Services and the Ayurvedic Department. The appointment was made in order to have an officer to oversee the total health sector independently and co-ordinate activities. Dr. Kariyawasam, retired from Government Service on the Wednesday after 26 years of service in the city of Colombo. Dr. Kariyawasam excelled in disease control, especially during the time of outbreak the cholera and dengue and in 2010 when he was invited to chair the Regional Dengue and Chikungunya meeting in Thailand. He was the President of Overseas Qualified Medical Graduates Association from 1988-1998 and obtained government employment for more than 2,000 graduates during that period. He was the secretary and later the President of the Association of Sri Lankan Graduates from Socialist Countries and Secretary and presently a Senior Vice-President of the Sri Lanka-Russia Friendship Society.